Moss landscapes offer a magical appeal with verdant expanses that seem to encapsulate our spirits with a sense of serenity. 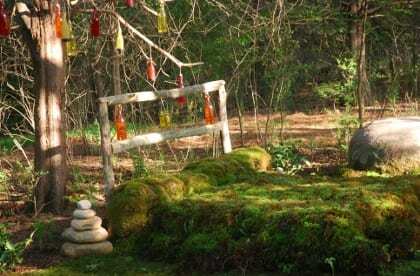 Yet, the environmental advantages of eco-friendly mosses add another element of magic through the creation of outdoor living spaces that complement natural ecosystems. As Planet Earth’s oldest living land plants (450 million years old), bryophytes – mosses and their cousins, liverworts and hornworts – are native to all parts of the world. 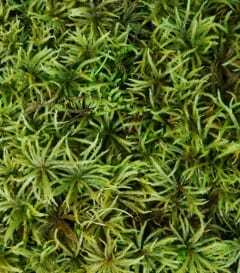 Mosses not only survive but actually thrive in climates and conditions considered unhospitable to most other plants. For instance, Ceratodon purpureus, a tiny, velvety green moss species with spectacular red sporophytes, lives in cracks of sidewalks in urban America…on top of European roofs with high heat index… even in sub-freezing temperatures in the glaciers of Antarctica. Phenolic compounds make mosses oblivious to cold, and therefore, typical U.S. planting zones are irrelevant when working with mosses. The year-round green of mosses makes them excellent horticultural choices in gardens for all seasons, including the winter. Even when covered in snow, mosses will continue reproductive processes. When the snow melts, young colorful sporophytes (equivalent of flowers) can be present and the vivid greens of new growth will delight you. Botanical characteristics of mosses are dramatically different from all other plants. Mosses will never have flowers, seeds or roots. Instead, rhizoids (root-like filaments) help hold plants to various substrates. Amazingly, these delicate rhizoids hold moss colonies in place during high winds or when subjected to heavy storms. Rather than drawing sustenance through roots, mosses eat and drink through one-cell-layer thick leaves. This feature allows mosses to hydrate quickly. Consequently, as moss landscapers, it is important to realize that brief yet frequent supplemental watering sessions are preferred over long, drenching soaks. Adjust installed irrigation systems or watering procedures to meet specific needs of thirsty mosses to thrive. When possible, walking on mosses during the establishment phase is advantageous to help rhizoids attach. Water and walk on mosses for best long-term results. For the environmentally-concerned landscaper, native mosses require NO chemicals – NO fertilizers – NO pesticides –herbicides. Since mosses “eat” dust particles in such minute quantities, fertilizers could actually hamper moss growth. Even organic fertilizers might provide too much of a particular nutrient or micro-nutrient. 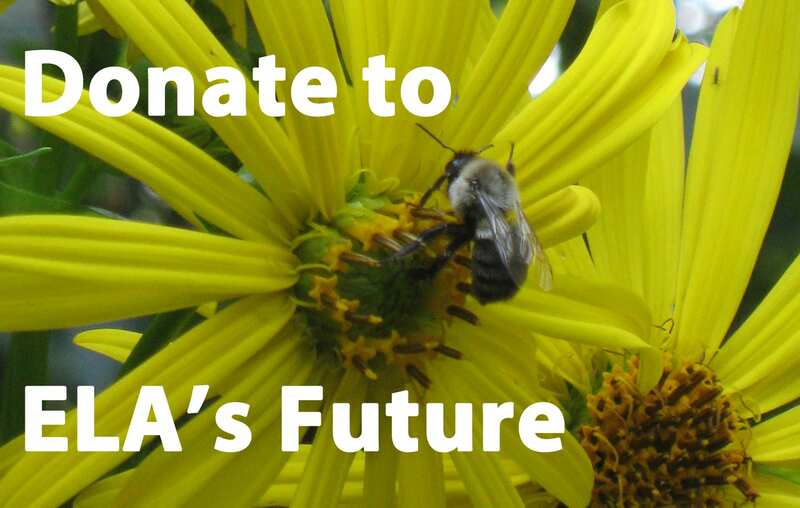 While beneficial insects, salamanders, frogs, etc. live in moss colonies, mosses taste bad to typical garden insect pests. 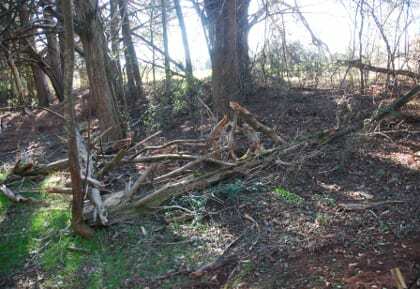 However, pesky critters (squirrels, birds, raccoons) searching for delicacies under mosses could cause some damage by dislodging mosses in their quest for food. Deer might stomp around, but they don’t eat mosses. Reindeer have been documented eating “reindeer moss,” but it is a lichen not a true moss (bryophyte). As for herbicides, mosses are not subject to disease. 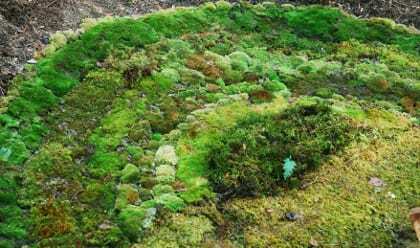 Mosses enable a naturally “green” approach to gardening. Further, you can remediate issues of erosion control, stormwater run-off and water filtration by intentionally introducing mosses. Polytrichum commune, an acrocarpus moss or upright grower, can be planted on steep hillsides in atrocious, nutrient-poor soil for an excellent solution to erosion concerns even in sunny locations. Polytrichum’s long rhizoids tenaciously hold red clay, gravel and sandy substrates in position. When using rip-rap rock for drainage, the harsh appearance is softened by introducing Thuidium delicatulum, a “fern-like” pleurocarpus moss or sideways grower. Rushing water slows down to enter the groundwater table gradually thanks to the absorptive properties of moss leaves. Planting mosses in drainage ditches reduces the impact of stormwater run-off. As a specialist in moss gardening methods, I’ve learned that is critical to move beyond generalizations about “moss.” Following “right place, right moss” guidelines, I choose appropriate moss species from both an aesthetic perspective and an environmental needs-assessment of the site. Over the past decade, I’ve observed mosses in nature, reviewed publications of bryologists, and then conducted my own research to develop protocols for successful moss cultivation. As a responsible land steward and confirmed moss lover, I want the mosses that I’ve personally rescued from imminent destruction (land development, road construction, roof replacement, etc.) to provide years of gratification. Committed to quality standards, Mountain Moss conducts field-testing for several years to ensure sustainability. 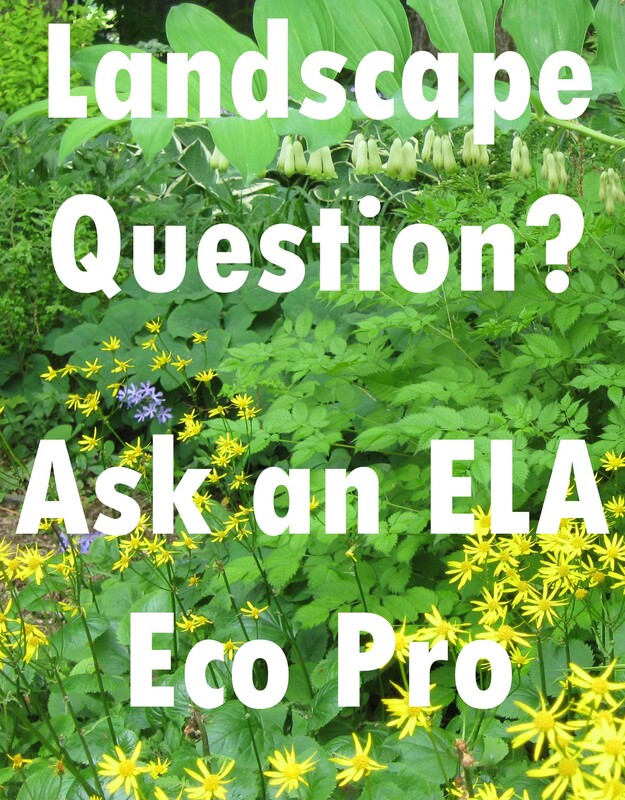 Cultivate live mosses for landscapes not crafts or floral purposes. 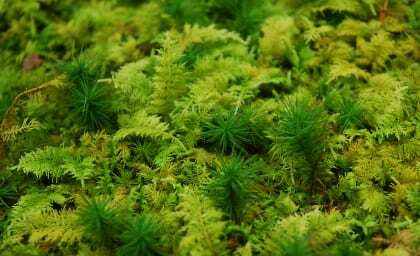 There is absolutely no magic in dried, dyed-green mosses that end up as decorative, dead elements for fake trees or as water-retention substrates for potted plants. So that future generations can appreciate mosses in natural settings, please do not take mosses from protected forests and parks. Alternatively, I encourage you to take advantage of rescue opportunities from places where mosses will be destroyed. For example, I climb up on roofs to gather mosses before roofers replace asphalt shingles. A few weeks ago, at the invitation of a Property Owners’ Association of an Audubon community, I rescued mosses growing on paved roads scheduled to be re-surfaced. 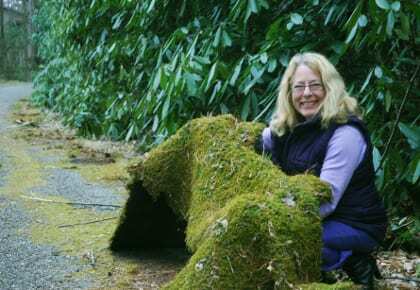 Save mosses; don’t steal them! 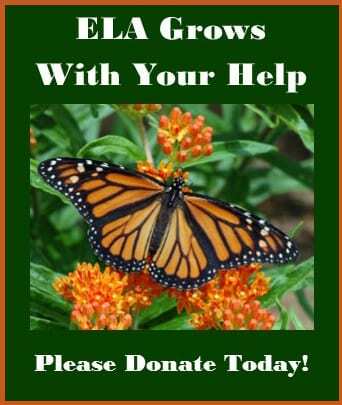 Whether you feel the magic or not, it is a rewarding experience to rescue native plants. Recently, I had the pleasure and privilege of feeling like a master moss magician. Imagine transforming over 2000 square feet of privet thicket into a serene, moss retreat…in the dead of winter…and in the midst of snow storms. Most landscapers would never attempt such a challenge. 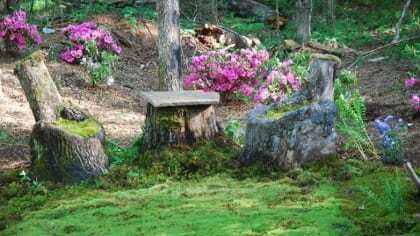 In preparation, the undergrowth of privet was removed and huge boulders along with custom log benches were carefully negotiated into place before mosses were planted. It snowed on the night that all moss inventory arrived on site. Confident in the survivability of mosses, I waited a few days for the moss trays and rollers to thaw out. Then the magic began. My crew and I accomplished our mid-February moss installation goal in just two days! Pre-vegetated moss mats rolled out like carpets to facilitate an easy and fast install. In this project, the substrate used for the mats also serves as a weed barrier fabric to help reduce any ongoing issues with the persistent privet growth. The positive comments received during a May Tour of Homes in Madison, Georgia confirm the success of this magnificent moss installation at Willow Oak Farm. Rather than establishing a moss garden with Asian design components, the owner wanted a distinctive American approach for integrating native plants – mosses, ferns and wildflowers – into relaxing areas offering a welcome escape from the scorching summer sun. With a variety of functional purposes, each moss terrace has its own distinctive whimsy and magic. In all moss gardens, barefootin’ is encouraged to fully experience the tactile pleasures of the cool, moist mosses. The upper terrace offers a sunset view from a unique moss bed comprised of Dicranum pillows, Aulacomnium bedspread and Polytrichum mosses as the bed skirt. Cairns (stacked rocks) flank each side of this first-of-a-kind moss bed with the faint aroma of Illicium bushes to heighten the sensory experience. An array of glass solar bottles hangs from the cedar branches providing glints of red, yellow and orange as well as night-time ambience. A flat stone with deep dimples accumulates water which attracts birds as well as pollinators like butterflies and bees. The next moss room is resplendent with thrones fit for any king or queen! Fashioned from hollow tree stumps with soft, fluffy cushions of Dicranum, this intimate conversation area beckons visitors to relax over a game of chess or to sit and sip mint juleps. Large boulders provide additional seating for conversation among garden visitors. Moss carpets of Atrichum, Plagiomnium, Rhodobryum and Climacium encompass the area. On a sunny hillside, a rainbow of sun-tolerant moss species offers additional focal interest. The main gathering spot provides a relaxing view of the trout pond from seating along a huge log, rock boulders or custom walnut benches. In the evening hours, a magical aura occurs as mosses glimmer in the light of dancing flames from the river rock fire pit. 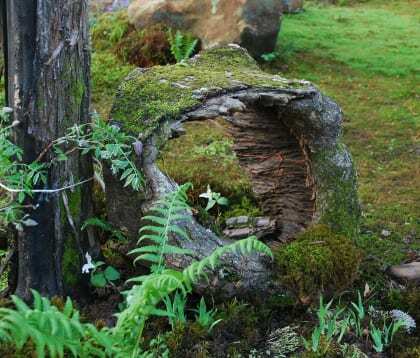 A portal view through a hollow log entices visitors to appreciate the petite aspects of mosses. In one corner, Climacium mosses rise above ground level like a miniature emerald forest of diminutive trees – a lush solution for this consistently soggy spot. The neon green of Atrichum’s new spring growth contrasts with the yellow-green tints of Thuidium and beckons visitors to enter. The nuances of green and variation in textures highlight the distinctive differences between moss species. A moss and stone patio affords yet another vantage point of the trout pond. To resolve erosion concerns, huge Polytrichum colonies line the cooling pool along the patio perimeter. These mosses offer a far more pleasing option in lieu of hay bales and rip-rap rock. By adding specialty mosses in the cracks between stones, the new rock wall and patio look like they have been there for years. Additionally, mosses placed strategically at the water’s edge enhance the gravel surround of the pond. Mosses add an instantaneous sense of permanence and antiquity to hardscapes. 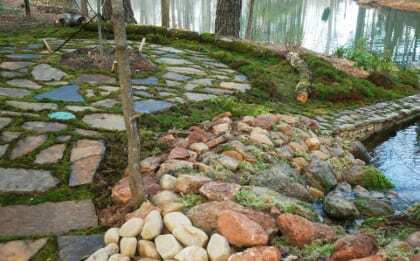 Creating innovative moss landscapes is particularly rewarding to one’s own spirit. I feel far more like a moss artist than a landscaper when creating magic with mosses. My connection with native mosses starts at the time of rescue and continues throughout the cultivation process to the finished moss garden features. Bryophyte beauty reigns supreme and environmental benefits rank high for the ecologically-minded. Why don’t you consider embracing the magical world of mosses, too? Annie Martin, known as Mossin’ Annie, is the owner of Mountain Moss. Her Mossery is located in the mountains of western North Carolina. 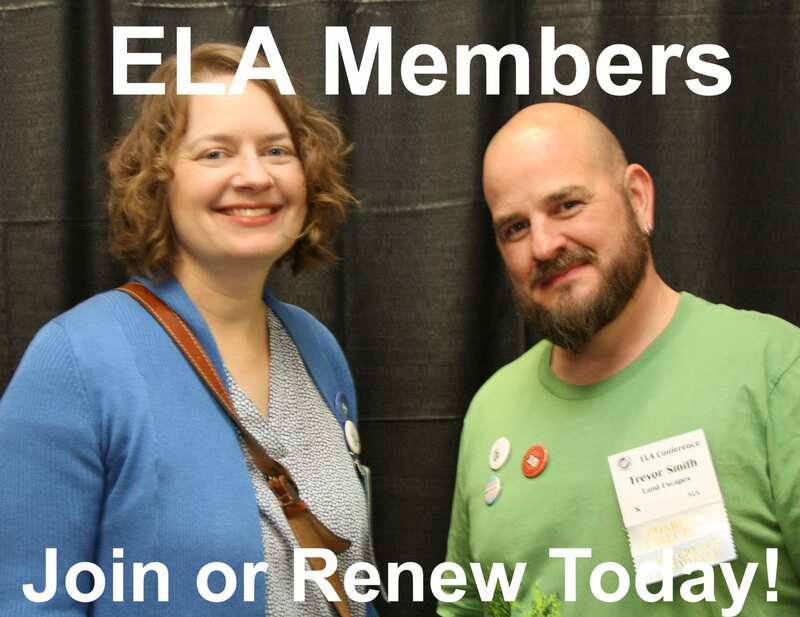 To learn more about mosses, please visit: www.mountainmoss.com. 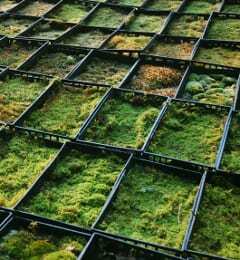 Live mosses for your projects (container trays, pre-vegetated moss mats, and lightweight panels for living moss walls or moss green roofs) are available through the online Moss Shop. 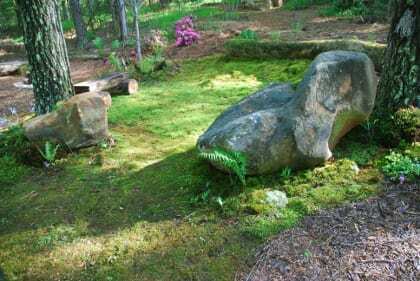 As experts in moss-scapes, Mountain Moss offers consultation/design/installation services as well as educational lectures/workshops so that others can experience their own moss magic. Martin will be sharing her passion for moss gardening in her upcoming book (Timber Press, spring 2015). Send inquiries via email to: mossinannie@gmail.com.